I attended Functional Conf 2016 at Hotel Chancery Pavilion, Bengaluru between October 13-16, 2016. The conference was on October 14-15, 2016 and there were pre- and post-conference workshops. After arriving early on the day of the workshop, I checked-in to my hotel accommodation. 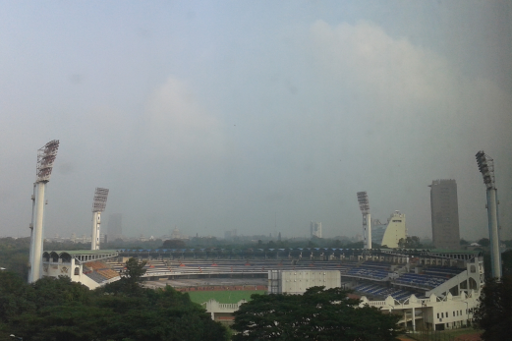 A view of the Kanteerva stadium from the hotel. I had registered for the “Deep Dive into Erlang Ecosystem” workshop by Robert Virding, one of the creators of the Erlang programming language. He started the day’s proceedings with an introduction to Erlang basics and covered both sequential and concurrent programming. He also gave an overview of the Open Telecom Platform (OTP) and answered a number of questions from the participants. He, along with Joe Armstrong and Mike Williams, designed the Erlang programming language for telecommunication, keeping the system in mind and all the way from the ground-up. He also mentioned how WhatsApp was able to handle two million concurrent connections on a single box, and they would peak at three million at times. As another Emacs and Lisp user, he wrote Lisp Flavoured Erlang (LFE). He did not have much time to talk about it during the workshop, but, he did share differences between Erlang, Elixir and other languages that are being built around the Erlang ecosystem. Robert’s keynote was followed by another keynote by Brian McKenna on “No Silver Bullets in Functional Programming”. He gave the pros and cons of using Functional and other programming paradigms, and discussed the trade-offs. A number of code examples were shown to illustrate the concepts. The next talk that I attended was by Aloïs Cochard on “Welcome to the Machines”. He gave an overview on the history of various Haskell libraries for data stream processing (pipes, conduit) and finally provided a tutorial on machines. Abdulsattar Mohammed introduced the need for dependent types using Idris with simple examples in his “Dependently Typed Programming with Idris” talk. The concepts were well narrated with numerous code snippets. The next talk by Debasish Ghosh on “An algebraic approach to functional domain modeling” was a modelling exercise on how to map business logic into functional algebra. He demonstrated a real world step-by-step process on the transformation from a problem domain to the solution domain consisting of algebraic data types, functions that operate on them, and business rules. Ravi Mohan started his talk titled, “Equational Reasoning - From Code To Math and Back Again”, with his learning in the Functional Programming (FP) world, and an overview of how to go about reasoning from code to math. His laptop had ran out of battery power, and he did not have his laptop charger. Before his scheduled talk, he had re-created plain text notes of his slides and walked us through the content. “Implementing Spark like system in Haskell” was an interesting session by Yogesh Sajanikar on his attempt to create a DSL for map-reduce jobs. He did cover much of the internals in his implementation and the challenges faced. The hspark code is available at https://github.com/yogeshsajanikar/hspark. 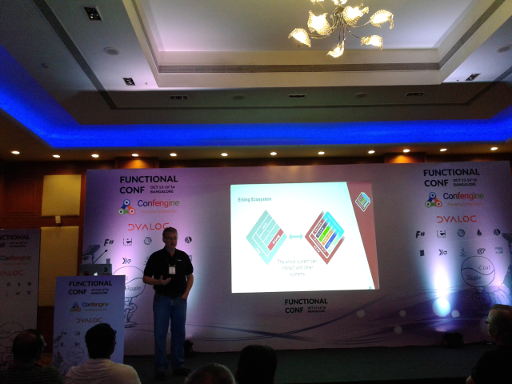 The second day began with the keynote by John Hughes on “Why Functional Programming Matters”. This was the best keynote of the conference, where John gave a very good historical perspective of FP and the experiences learnt in the process. His slide deck was excellent and covered all the necessary points that were part of his famous paper with the same title. This was followed by a series of demos on cool features in Functional Programming languages - Erlang, Idris, APL, F# and Julia. “Using F# in production: A retrospective” was a talk by Ankit Solanki on the lessons learned in using a functional language in implementing a tax e-filing application. They heavily use F# Type Providers to handle the variation in input CSV files. “Real world functional programming in Ads serving” was a talk by Sathish Kumar from Flipkart on how they used functional programming in Java 8 for their product. They initially prototyped with Haskell, and used the constructs in Java. I skipped the next talks, and spent time with Robert Virding in the Erlang booth. Rethinking “State Management.” was presented by Tamizhvendan S. He narrated examples on state management for a cafe application using F#. He also gave a demo of Ionide text editor and its features. I attended John Hughes workshop on Property-based Testing. Initially, I thought he would be using Haskell QuickCheck, but, in the workshop he used the Erlang implementation. John mentioned that the Haskell and Erlang implementations are different, and their interests have diverged. 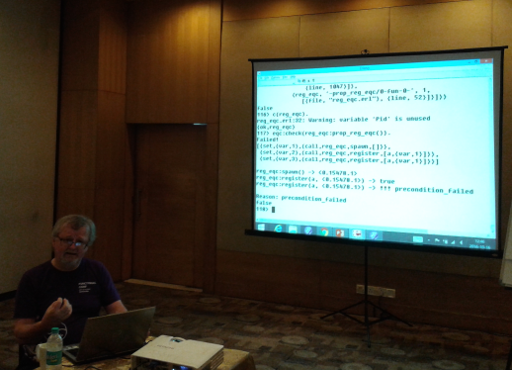 He started the workshop by taking an example of writing property tests for encoded SMS messages using Erlang. He also demonstrated on how a minimal test example is produced when a test fails. The choice of deciding on what properties to test is still an active research problem. He also demonstrated how to collect statistics from the test results to analyse and improve them. He also shared his experience in generating tests for Klarna - an invoicing service web shop that uses Mnesia - the distributed Erlang database. He concluded by saying that we should not write tests, but, they shoud be generated. Overall, the workshops were quite useful. It was good to have met both Robert Virding and John Hughes.